Cover art: Perfectly shows both character and story, two young men who are torn by what their families expect and by what they feel. Both title and author name are clearly readable. Synopsis: Very thorough, almost gives too much of the story away. Also states it’s a mature young adult romance. Plot: Two young men are raised as almost cousins, but realize they have feelings that are deeper than that. This is a raw, emotional tale of two young men and their “almost family” torn apart by homophobia from one set of parents and brought back together by the love of the other set. Main characters: Tom Stecker and Vince Bucci. They are both eighteen and share a love of soccer and each other. Secondary characters: Michael and Sheila Stecker are Tom’s parents. They expect Tom to follow the path they have set for him even if it’s not what he wants. Mike Jr or MJ and Dave are his brothers. Dave is the more likable of the two. Jenna Moore is the girl Tom’s parents plan for him to marry, to save him from the sinful attraction they see he feels for Vince. Paul and Gina Bucci are Vince’s parents. They are loving and accepting of their kids and want what makes them happy. Dee is Vince’s little sister. She’s very protective of her big brother. Flow, continuity and editing: The story had a good continuous flow and plot. However I did find two errors that consisted of missing sentences. Conflict and climax: The conflict came from Tom and his struggle to please his parents and his own desires that he felt which went against their beliefs. Throughout the story he struggled, and his and Vince’s relationship was damaged. The climactic reunion was raw with emotions, as we see Tom physically ill from being torn apart internally and reaching out, realizing he has to be true to himself. The fallout leaves him where he belonged all along. Conclusion: This was a heart wrenching story to read, Tom and Vince struggled to be together and hatred almost won out. I wasn’t sure if Vince would give Tom another chance, even though you can see he still cared. Tom finally standing up for himself made it worth the read and the tears. I cried during the final scenes, you could feel the love coming from the words. Previous Book Review: The Eastling by James Collins … 10 out of 10! Next Book Review: Earthly Pleasures by Sera Trevor … 8 out of 10!! yay!!! 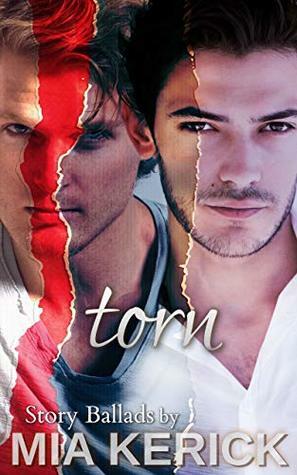 so happy you liked Torn!! Thanks for the review!